Well, it’s happened. 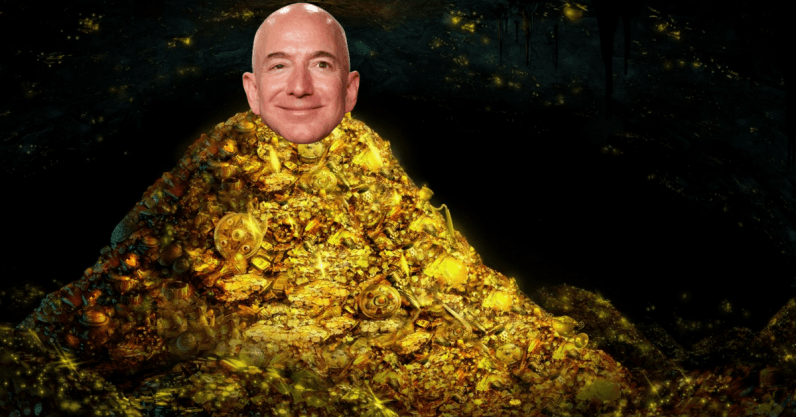 Amazon‘s CEO and founder, Jeff Bezos, is now the richest person ever. According to Bloomberg, Amazon’s recent stock rise means he’s now worth $150bn – outstripping what Bill Gates was worth in 1999. It’s hard to actually imagine just how much money 150,000,000,000 actually is, as the figure is so ethereal. Don’t worry though, we’re going to put it into perspective. The world’s leading fast-food chain has a market value of $129.9 billion, so Bezos would have another $20-odd billion to play about with afterwards. Hell, he could use this extra cash to rebrand the fast food chain to Bezos Burgers. All I want for this work is a paltry 10%. That’d be 19.7 slabs of meat between bread for every human on the planet, providing them each with 5910 delicious calories. This is what each and every one of us could get. Very droll. $150 billion is serious money though – what should he actually do with it? So getting more serious, here’s one idea: he could visit his own website and maybe buy some of the things on there? You know, some things that could help the world? Makes you feel a little bit ill, right? No one needs that much and, when you consider the problems that could be solved with that money, holding onto it becomes obscene and indefensible. You know what? Screw folks in need, let’s just focus on getting the rich to the moon instead.